I'm sure there are parts of the town you live in that you think you could design or run better, and with MyTown 2 you get to see just how good you are. Starting out in the game is really easy as you are guided in what to do and are given missions to get you started on the basic stuff. Of course you need to make sure there is plenty of housing for the residents of your town, and to make it attractive, but the main attraction here is building the businesses. Obviously you need to make sure that location settings are on for this game, otherwise the added fun factor really won't work. 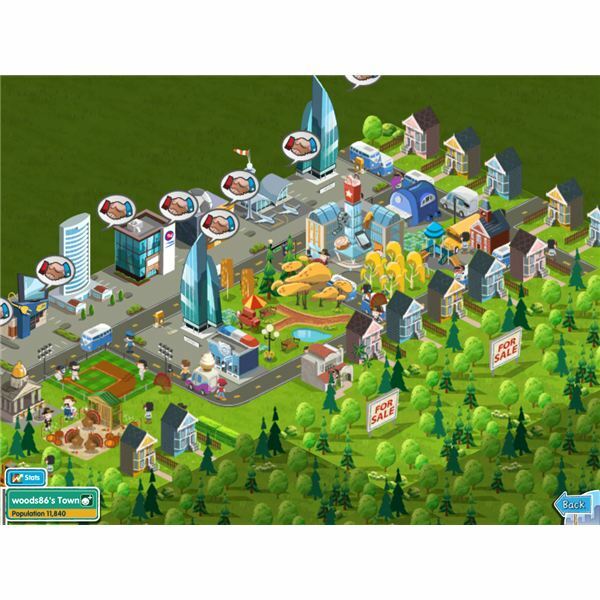 It's actually pretty fun to see all the businesses listed that you can buy for your virtual town as no doubt you will recognize them. I'm not sure where the listings come from though as there are a number of notable omissions on my list which may or may not bother you. It only became an issue for me later in the game with certain tasks, but this all depends on where you live of course. Your currency is coins and notes; as with most games of this type you earn coins to build more or buy more land and the notes come in handy for speeding things up or buying premium items. You get given a certain amount of notes to begin with and can earn more throughout the game — of course there are in-app purchases for you to buy more with real money should you wish to. Once you've built a business you'll need to make sure your workers get to work. You need to invest a certain amount of coins depending on what type of job you want to give them to do. A 3 minute job costs nothing, but the rewards are smaller, and there are different time choices right up to 10 hours. Once a job is complete you'll get your pay and the option to start another job. The number of businesses you can buy depends on the population of your town, so you really need to make sure you get a balance of businesses, houses and community or decorative features. Once you earn a sufficient amount of coins and you run out of space you can tap on nearby land marked "for sale" and purchase that land — it takes a few hours for your workers to clear the land ready for building. As the businesses make money for you by completing jobs, housing earns you money as well as you collect the rents; so there should usually be a good flow of income. Community buildings add to your overall population, and decorations are just there to look nice — who wants to build a concrete jungle! The added touch with this game, is that as you are building local businesses you can (and should) check-in to them. This is purely virtual by the way, you don't have to personally visit them and check-in a la FourSquare. You are allotted so many check-ins per game day and can earn more by completing missions. Check-ins allow you to speed up jobs to twice the speed, as well as adding XP as you earn bonuses. Bonuses are indicated by a graphic to the right of the business name and will feature such bonuses as cracking the whip, busy bee, checking in to 5 different retail business in a day etc. While I would recommend checking in to your own businesses to speed up jobs, you are certainly not limited to just your own businesses; you get a whole list of businesses in your area that you can check-in to. The more check-ins a place gets the more expensive it becomes for everyone else to buy. You'll find popular businesses like McDonalds will have a lot of popularity due to check-ins and the purchase price reflects this. You can earn XP to get you to the next level and a handy stash of coins too, if you complete certain missions that are set for you. These are not compulsory, but if you can complete them then do, as you get big rewards. If you forget your mission at any time then just tap on the helper at the upper left of the screen to get a list of what you're being asked to do, and how far along you are at achieving it. The only time I found this annoying was when they wanted me to check-in to three local coffee shops. Although there are coffee shops in my town none were listed in the game, and when I searched for local businesses (where your mileage range is expanded), none were found either. Probably not an issue if you live in a big city, but this is certainly a downside of the local nature of this game. 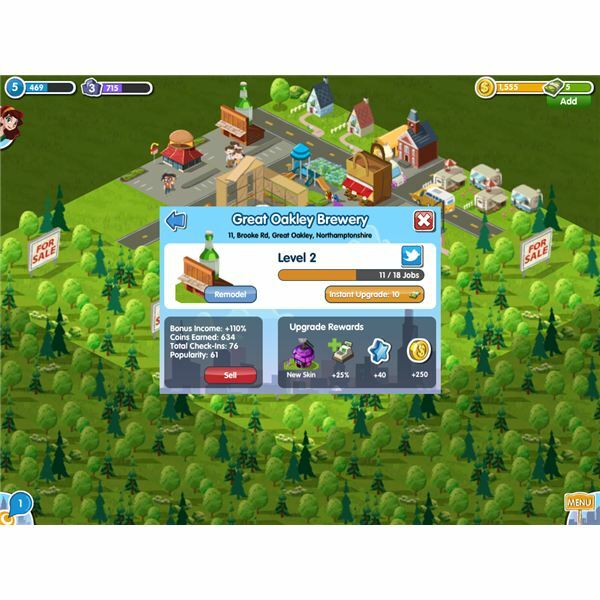 A recent update to MyTown 2 is the added social function of being able to visit other people’s towns. I imagine this could be a really cool way to make new “friends” without the annoying side to it. So upon tapping on the friends option from the menu you get presented with different towns that people are building in your vicinity. You get to see their town name (should they have one), their population and how far away from you they are, as well as being able to visit it. The real bonus here is that you can do deals when visiting these towns by franchising work back and forth between you, which is an interesting idea. I haven’t used this as yet (at time of writing it was just released yesterday), but I did like being able to have a nosey at what others had built for a bit of inspiration on future builds in my town. So now you know how the game works, some useful tips to help you on your way might be nice: here goes! Don't be snobby about your town in the beginning. Even if you don't want a trailer park it gives you more rewards for less outlay than either of the beginner houses. Turn on push notifications. It keeps you updated on the progress of buildings and missions when you are busy doing other things so you don't forget about them. So basically you can earn rewards even when you aren't playing the game. If you have a mission to check in to so many different types of one business but can't find that many close to you, then try using the search feature at the top of the list — be careful to check the category type and not just the business name though as some have been categorized incorrectly. You get better bonuses when building your businesses if you are a trailblazer. In other words be the first person to build that particular building and you'll get a trailblazing bonus as well as buying it at a bargain price for getting in there early. This also puts you ahead of the game as the more popular a business is the higher the price, so you've just put the price of that business up for anyone else that wants to buy it. You can check if a business qualifies for a trailblazing (or any type) bonus by looking at the check-in screen before you go to the business building menu. Give your businesses a 10 hour task to do before you go to bed — earning you coins as you sleep. If you need XP to get to the next level, more than you need coins, then buy high XP items and then sell them. This tends to vary, but small houses are usually good items to try this with. If you need to up your population to be able to buy more businesses then consider adding a community facility rather than more houses. Playgrounds look good as well as adding to your population, but most of the community options will give you more population for less space than building houses. It's true that you don't get money from providing a playground whereas you get rents from houses but by adding community buildings you are beating the missions to the punch anyway and adding to the overall look of your town. If you have any more top tips for MyTown 2 then don't be shy in sharing them — I'd love to hear from you.